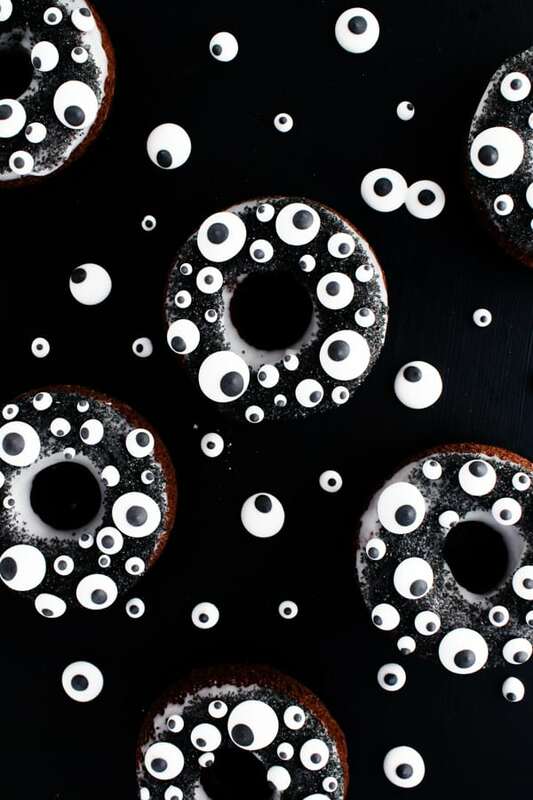 Make your Halloween morning, party or office potluck spooky AND sweet with these easy monster eye doughnuts! Halloween is just around the corner! And you know what that means: Halloween treats! To celebrate, I’m doing a reboot of some of my favorite recipes and tutorials. 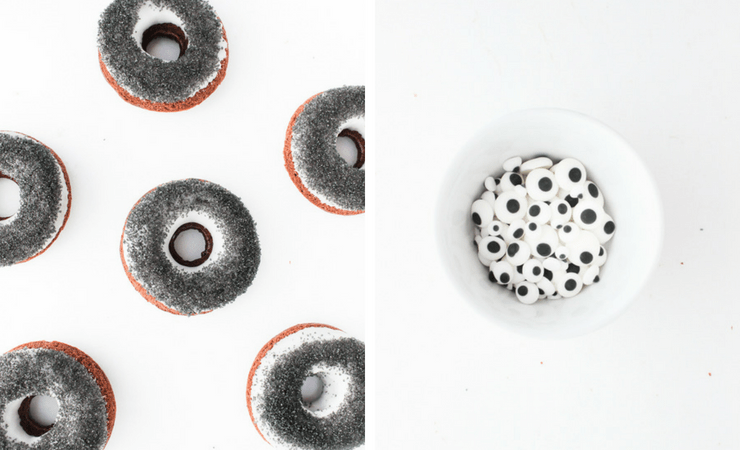 First up: doughnuts that are every bit as easy and they are spooky (and delicious). First, whip up some royal icing eyes or buy some at the store. Personally, I made mine so that I could have variety of sizes. Second, whip up some doughnuts. Either follow the chocolate doughnut recipe below or whip up another favorite flavor. Third, decorate! All these doughnuts require is a little icing, black sanding sugar and gluing those royal icing eyes on with a little bit of chocolate. 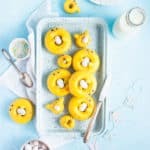 New to baking and decorating doughnuts? No worries! Here are some tricks and tips to help you make the perfect batch the first time around. Use a piping bag to pipe your doughnut batter into your doughnut pan. This is a lot easier and less messy than trying to pour from the bowl. Doughnuts are easiest to remove from the pan while they’re still warm. The sweet spot seems to be about 2 minutes after they come out of the oven. Simply turn the pan over and gently shake it until the doughnuts come out (hot-pads are a good idea). Did you know you can make your own sanding sugar? If you can’t buy black sanding sugar at the store, here’s how to make it. Be sure not to over-cook the glaze. Over-cooked glaze loses too much liquid and becomes too hard and thick to work with. 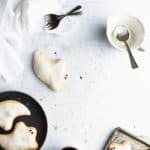 The best way to make sure your glaze doesn’t get over-cooked is to cook it over low heat and remove it immediately once a crust starts to form. If your glaze becomes over-cooked, simply add more water in 1/2 tsp increments until the glaze breaks up enough to use. Why we cook the glaze: You may be wondering why we’re cooking the glaze. After all, there are lots of doughnut recipes on the web that don’t require this step. Here’s why: cooking the glaze causes a chemical reaction that results in a glaze that hardens quickly and becomes a shell (rather than a soft glaze). 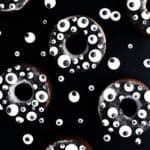 It’s perfect for locking in moisture and making life easier if you need to pack these doughnuts. Leftovers: Baked doughnuts don’t keep well and tend to dry out faster than the fried variety. If you end up with leftovers, the best way to store them is in a paper bag. Whatever you do, don’t refrigerate them or put them in plastic. Reviving stale doughnuts: If you wound up with leftovers and they’ve gotten stale, no worries! You can soften them back up by microwaving them in 5-10 second increments until soft. Just watch out for melting icing. In a large bowl, whisk together the dry ingredients for the doughnuts (flour, sugar, cinnamon, baking soda and baking powder). In another bowl, whisk together the wet ingredients (melted butter, egg, vanilla extract and pumpkin puree) until just combined. Whisk in dry ingredients. Use vegetable shortening and a paper towel to grease your doughnut pan. Fill a piping bag with the doughnut batter and pipe it into the doughnut pan until each cavity is about 2/3 full. Bake the doughnuts at 350F for 8-10 minutes, or until a toothpick inserted into the doughnuts comes out clean. Allow to cool in the pan for 1-2 minutes before turning them out onto a baking rack. In a small saucepan, combine the powdered sugar, water and vanilla extract for the glaze. Cook over low-medium heat, whisking occasionally, until the glaze is warm and starts to form a crust on top. Remove from heat. Dip each doughnut into the glaze, gently shaking it to allow any excess glaze to drip off. Immediately dip your doughnut into the sanding sugar (it will crust quickly). Be sure to stir the glaze between each doughnut so it doesn’t form a crust. Melt 3-4 squares of chocolate (any kind of chocolate will work), and spoon it into a piping bag, or into the corner of a ziploc bag. 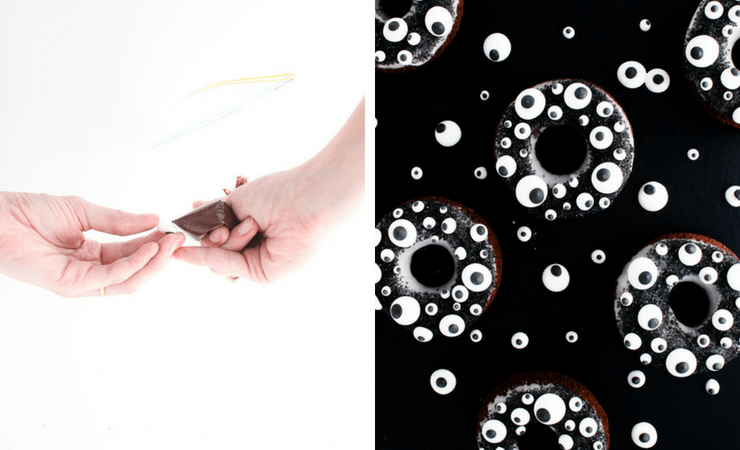 Pipe a little chocolate onto the back of your royal icing eyes, and gently press them onto the tops of the doughnuts. Allow the chocolate to harden completely before packaging the doughnuts. Update Notes: This post was originally published in October of 2015 but was republished with step by step photos and tips in September of 2018. These are absolutely awesome!!!! Love them so much, such a fun bake! What an awesome idea! Definitely filing away for a special Halloween treat this year. Ahhh they are staring at me! Cool doughnuts Claire, well done! These are super cute and creative! I have to say that some Halloween treats I’ve seen on Pinterest/internet so far have been questionable, but I like these haha. Pinning! I hear ya! Kitty litter cake and zit popping cupcakes?! There are lines people, LINES! <-- And this said by someone who tends to enjoy mildly gross Halloween fair. OMG these are soooo cute. My grandkids would LOVE these. I think I just might have some of those “eyeballs” leftover from another decorating project. I need to get in the kitchen and surprise those kiddos! These are so freakin’ cute! I love fun festive treats like this because they’re fun to make too. I bet my niece would love these! This first image made me go, “OOOOH!! !” out loud! Great idea and a unique recipe! I love it! Oh these are so cute and perfect for Halloween! These are so adorable and prefect for Halloween! I love decorating and baking fun Halloween stuff. It’s my favorite holiday! The doughnuts are simply adorable! I love the eyes…very spooky indeed. 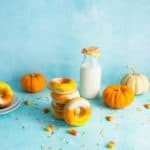 Also, this post is chalk full of some really great doughnut related tips and was very informative! Such helpful tips to make these!! I love it! They look so much more complicated than you described! I think I can actually pull these off!! I’m going to give them a go!! These look INCREDIBLE! You never cease to amaze me with your creativity and gorgeous photography. 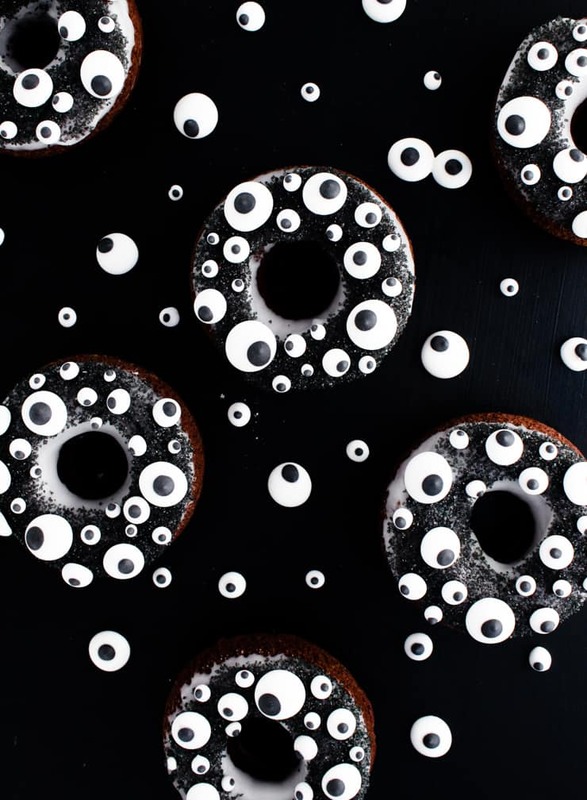 I love how creative you are and love these fun Halloween donuts. These look great and I love baked donuts! The decorations on the donuts are fantastic and simple enough that I can have my niece help me too. I literally just bought eyeball candies for another project and have a bunch leftover. These are happening tomorrow!!! These are the perfect Halloween treats! Great for upcoming school or office parties for the holiday. These are so cute! And so fun for halloween. I think we will give them a go! Oh, I love all the eyes! The different sizes are so much fun. A wonderful – and slightly different – Halloween treat! OMG! 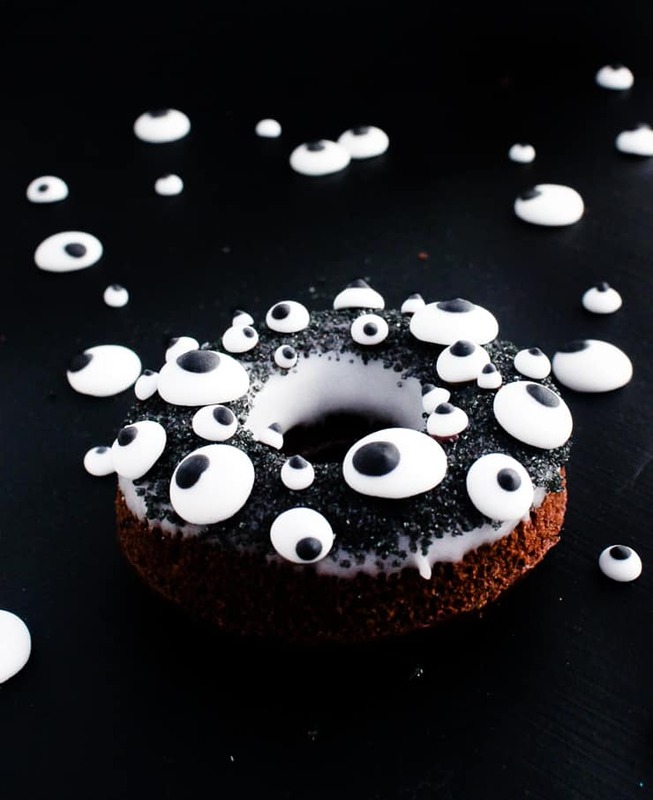 These donuts are the cutest and spooky donuts ever! Love the design and the recipe! Making them next week! These are so adorable! (Or am I supposed to say that they’re so scary?) My son’s preschool class is going to love them for his Halloween party! These are great for kiddos! 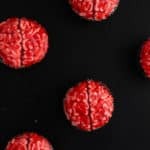 I will have to make these for Halloween morning!